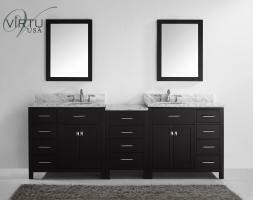 This twin sink vanity offers loads of style and great functionality for the bathroom. The two bases at each end surround a bank of drawers in the center that provides more storage space as well as an extra counter top area. 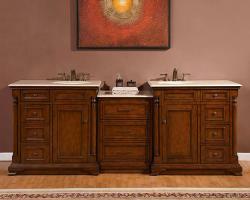 The wood material is finished with a deep espresso tone that is accented by the brushed nickel hardware pulls. Each of the top sections is created from travertine that slopes to form the integrated sink basins. 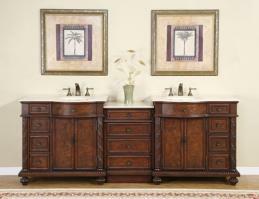 With two single door cabinets and nine drawers this piece will make keeping the bathroom neat and tidy a breeze.